I am often asked about the ability to report on HCM and or payroll data in SAP SuccessFactors using Workforce Analytics. Each time I get the question I find myself explaining the important difference between reporting and analytics. This blog outlines the 3 main reasons why customers may need a solution for both. For starters, SAP SuccessFactors Workforce Analytics (WFA) is not a transactional reporting tool. Rather WFA is a purpose-built analytics application for line of business HR. SAP SuccessFactors combines BI capabilities and predefined content. For content, at its core are metrics packs, which are groupings of metrics for various HR and talent management functional areas, including Employee Central, Recruitment, Learning, Compensation, etc. Each metrics pack requires its own configuration and implementation with Core Workforce and Mobility as the foundational metrics pack based on data from your core HR system of record. Customers used to have to purchase metrics packs separately, but since 2013 the WFA license has included ALL metrics packs. These two distinct capabilities are designed to solve two different business challenges, each with their own ROI. The easiest way to think about is to consider the difference between reporting and analytics. You may have seen various people use the terms “reporting” and “analytics” interchangeably. It is important to point out that reporting and analysis are very different in terms of their purpose, tasks, outputs, delivery, and value. Reporting is best defined as: The process of organizing data into informational summaries to monitor how different areas of a business are performing. Analytics is defined as: The process of exploring data and reports in order to extract meaningful insights that can be used to better understand and improve business performance. 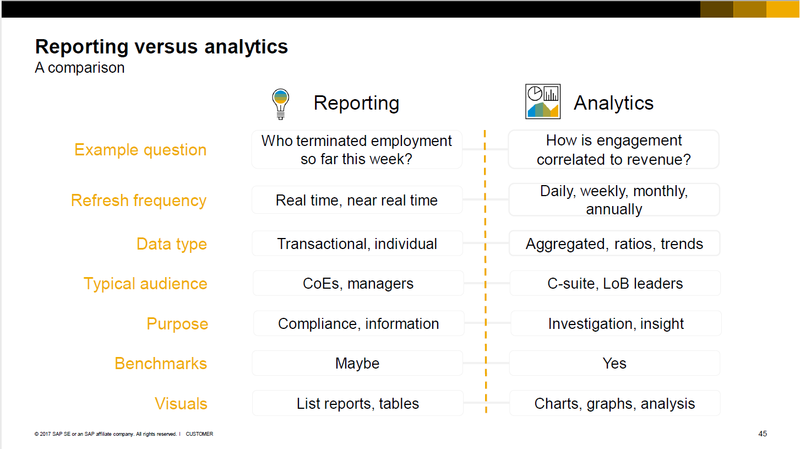 I know it seems just like fancy jargon, but this graphic – provided by SAP in its Analytics Roadmap update from SuccessConnect 2017 – does a better job of pointing out the nuanced differences between the two. The ROI of reporting is achieved by decreasing the effort required to deliver data to consumers and the ROI of analytics is achieved by increasing the business value derived from using the data in people decisions. In WFA, you have the ability to select fields or data to analyze from a pre-determined model (sample shown below from SAP’s Workforce Analytics Implementation Guide), however most of the work is not done at table/field level. The process becomes less technical and more in HR language where users are access metrics by their name, and filtering and slicing and dicing according to characteristics (or dimensions). For each functional area in SAP SuccessFactors (or any 3rd party HR or talent management system of record), this sophisticated model takes pre-determined source data fields from your system and transforms them in conjunction with base input measures, dimension hierarchies and derived input values to produce meaningful result measures (output). This is often not transactional data. Returning to the SAP graphic shown earlier in the blog, this is aggregated or summarized data often shown in conjunction with other key variables. Using our previous example, the output in WFA would focus on the overtime rate (for example). This could be looked at by department for a particular age group, and if the user chooses so, they can drill to see individual level detail. WFA could be used to produce a trend correlation analysis between a segment of employees who worked overtime and employee retention. In Workforce Analytics the focus is always on the segmentation as opposed to individual, with the ability to drill to see the individual’s details. A main objective is to identify systemic issues in an organization, and then drill to the individual level. This will help to keep focus on large issues rather than getting bogged down with individuals, who could be an anomaly. Organizations often require both a reporting tool and an analytics solution like WFA to answer different types of questions. According to an interesting survey about Driving HR Impact in a Changing World commissioned by SAP SuccessFactors, organizations are spending over 850 hours on average per year on HR reporting. Of those 850 hours, almost 70% of it is based on admin and professional reporting as opposed to strategic planning and analytics. As you may know, each of the first three options still use SAP payroll as its foundational source. On-premise is the same as you have now, ECP is a re-implemented simplified version of the SAP Payroll you have now and the Managed Payroll is the payroll you have now, as is, hosted on a cloud server. So essentially, each of the first three scenarios uses traditional SAP Payroll behind-the-scenes. If there is one thing we all know, it’s that reporting on SAP Payroll is not easy to do and accessing transactional data can be cumbersome in SAP using utilities like the Wage Type Reporter. WFA on the other hand, offers content related to payroll analytics by leveraging data from payroll results. This is not an all-inclusive list, but it gives you an idea of the types of data that are available for payroll. There is some very good analysis stuff in here that you would not traditionally find in SAP on-premise reporting, including “Direct cost of voluntary termination and “Actual headcount as a percentage of plan”. This type of curated data is possible via integration with other metrics packs. However, the transactional pay reporting that Payroll managers use to reconcile their payrolls, etc., is not included in the WFA metrics pack. Detailed payroll reporting often includes Payroll registers, Wage Type Analysis, Payroll Reconciliation reports (including retros and claims), Gross to Net Pay to Pay Difference, Payroll Reconciliation Wage Type Analysis, etc. Currently, this type of transactional level reporting is not part of WFA. This type of data is available via custom coded abap or a third party vendor solution that specializes in transactional or operational reporting.